Document your exciting discoveries using Ken-A-Vision's 1401KRM 2.07MP PupilCam for Microscopes. This USB 2.0 digital camera has a rubber adapter and can be easily attached on top of your microscope's 25 -34mm eyepiece. It connects to your computer via a USB cable and allows you to capture your findings as 1920 x 1080 JPEG images or 1080p HD videos and save them on your computer. Using the included plug-and-play Applied Vision 4 Software (compatible with select versions of Windows, Mac, and Linux), you are able to control many functions and settings pertaining to digital imaging and microscopy. Among many useful classroom and presentation features are its compatibility with interactive white boards, image/video capturing functions, and digital image analysis functions. Box Dimensions (LxWxH) 6.6 x 5.1 x 4.5"
1401KRM 2.07MP PupilCam for Microscopes (Black) is rated 4.0 out of 5 by 1. Rated 4 out of 5 by Comedore from This is a camera... 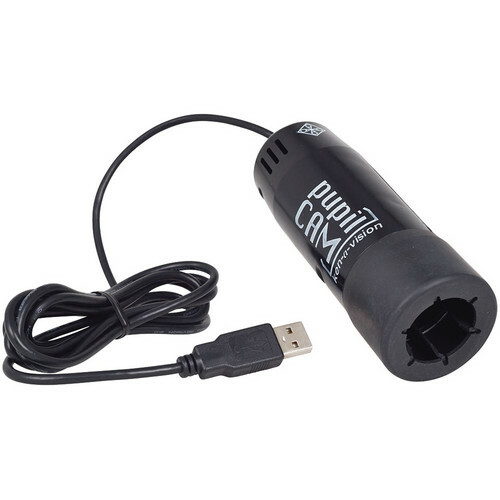 I haven't tried other USB microscope cams so I can't compare. But I used this for a presentation to a series of fourth grade classes and it was a hit. I ran it through my laptop to a 21 computer monitor for the class to see. The display on the monitor was not as clear as what you could see when you looked throught the microscope with your own eye. But it was clear enough to see the cell walls in the pond algae so it was very workable. The kids were thrilled when they saw things moving in the pond water. Then they went off to look at their own specimen in their own microscope. The software included is not the Vista version. I had to get it from the website and it worked great.